When people laugh, you can often see it sparkling and twinkling in the posterior tooth region. Metal dental restoration! It might be tolerable from the functional aspect, but not from the aesthetic point of view. Porcelain restorations, made of 100% dental porcelain, are the alternative. Compared to composite fillings, they are much more stable and resistant to the masticatory forces, transmitted steadily to our teeth. As our master dental technician has to fabricate the restoration, it needs one additional treatment session. 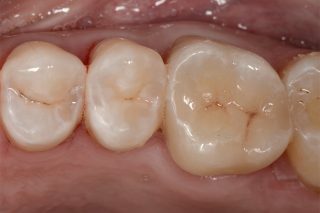 Besides that, it is more difficult to place the porcelain on-lays than to fill a cavity with composite. As on-lays are bonded with synthetic adhesives, teeth have to be isolated with a rubber dam, so no saliva can negatively affect the bonding. High stability is the reason for using on-lays! If the cavity or the existing restoration is too large, or complete tooth cusps have been lost, composite fillings are not strong enough to absorb the total masticatory forces. 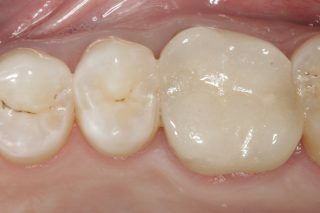 And it is often impossible to naturally model the lost tooth substance with composite. In the case of on-lays, it is fundamentally different. Porcelain is so stable to absorb the masticatory forces and additionally stabilize the tooth. Moreover, with the dental impressions our master technician can exactly reconstruct the tooth in its ideal form. You will feel the difference! Form, colour, contour and bite fit perfectly! It does not only look very good it also guarantees long durability. You certainly know, that we grant–under certain circumstances-a warranty more than double as long as required by law. One more advantage, ceramics are bio-compatible and, unlike metals, there are no allergies or oral galvanism due to different alloys in the mouth. And this improves your well-being. Do you have any questions or are you interested in porcelain restoration?Arrange an appointment with, us-we are pleased to advise you!